Wolf tracks – note oval shape with large claws. Big, too! 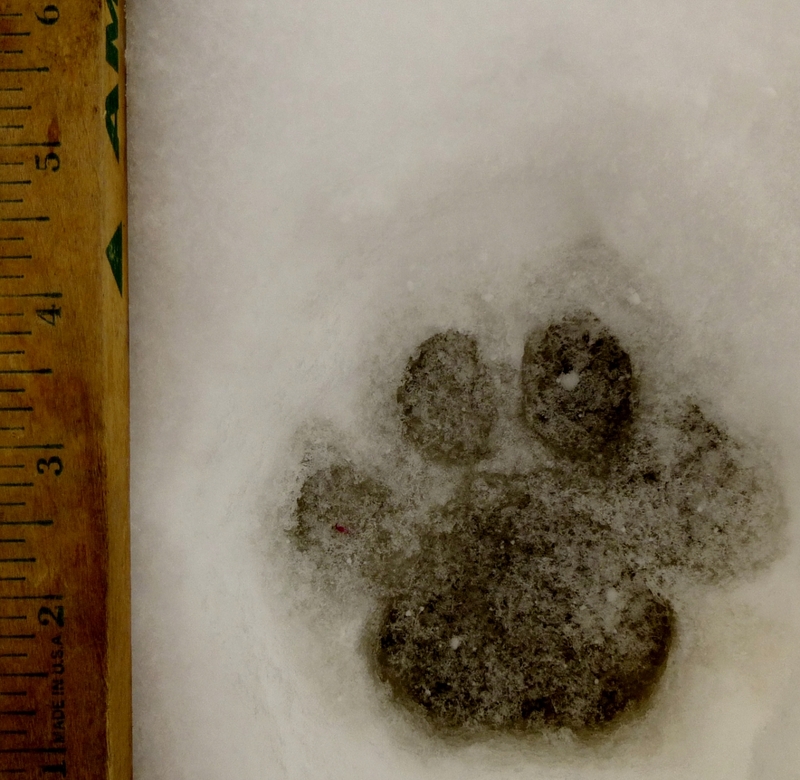 Ok, the other day I shared a mountain lion track and talked about what makes a cat track distinctive. Well, a few days later we found a very excited herd of bison when we went to feed. They were snorting and bucking and kicking up their heels, quite literally. That happens with them, and sometimes for no particular reason except that they feel good, but this time was a little different. Like they were proud of themselves or something. It wasn’t until my walk that I found out what had gotten them riled. Wolf tracks crossing through our aspen drainage. I followed the tracks and found that, while the wolf pretty much made a straight shot across the ranch, all the other ranch inhabitants certainly didn’t ignore him. I found where a deer had bounded across the wolf tracks and the buffs had milled around behind the wolf and completely obliterated the his tracks in other places. It didn’t look like the buffs chased the wolf, and he certainly hadn’t chased them, it was more like the buffs wound around behind the wolf and kept him on the move. I also found a set of coyote tracks that came up to the wolf tracks. 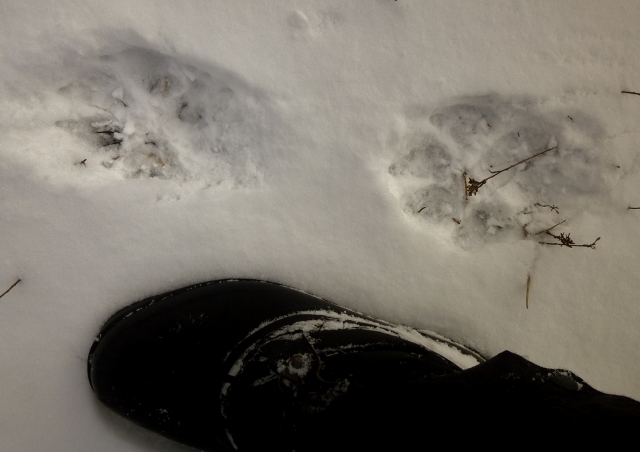 Stopped (probably sniffed them), then began to follow the wolf tracks – the opposite direction the wolf was going! That coyote’s mom didn’t raise no dummy!! So very cool! Coyote track, wolf track. I’ll leave you to guess which is which! Just a big kitty track. As many of you know, I love snow tracking (ok, when one lives at 6000′ in the mountains of Montana, one better figure out ways to enjoy snow!). 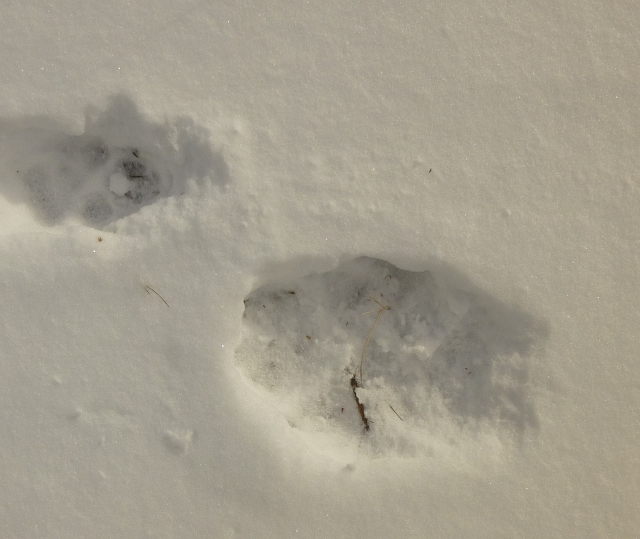 And while there are always tracks to follow in the snow, there’s something exciting about seeing big cat tracks just a few hours after they’ve been made here on the ranch. (Makes one look up at the trees and over one’s shoulder as well :). And these tracks were just perfect for seeing exactly what identifies these as cat tracks. Round and round. Round toes, round print, no claws. My little housecats have tracks that look just like these. Only lots, lots smaller. I’ll compare these to some canid tracks in the next blog.